Religion will always be something of an unavoidable issue in Ireland, though the Constitution prevents the State from endorsing any particular one. Officially defined as Christian, according to a 2011 survey 78% of the Irish Republic are Catholics, but that strength of belief is far less obvious in the East. The cosmopolitan effect of Dublin means the population are far more likely to declare themselves as not being Catholic or having no religious beliefs. The effect carries down South through Wicklow to Wexford where the roadside shrines to Our Lady are far less numerous than they are in the West. 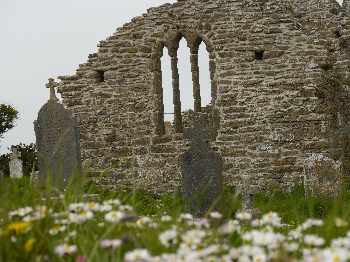 County Wexford was one of the earliest parts of Ireland to be Christianised and every now and again you pass the skeleton of an abandoned local church as much a preserved fond remembrance as any levelled cottage. 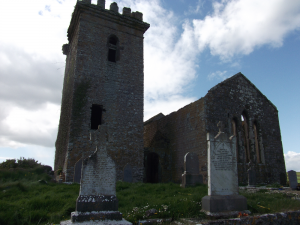 Still, the Irish persist in the habit of burying their dead in the consecrated shadow of a church, even if the church function is long left derelict. Somehow, to an outsider (and a heathen non believer at that) it is as meaningful as it is poignant and supporting the oft spoke belief that anyone with Celtic blood is never more than one breath away from their heritage. Though their histories are intertwined, not always happily it has to be said, the horror of the clearances still haunts the landscape in rural Ireland, there are some fundamental differences between the Irish and the English. The Irish currency is Euro’s (the death of the Irish punt still mourned by my other half), distance and speed are measured in kilometres and Km per hour. The Irish are incredibly house proud, post offices are green, schoolgirls wear plaid skirts, women rule the roost and an idle man is rarely seen. The menfolk are as often as not seen tending the kids, keeping the outside house clean and tidy and never happier than when digging a hole or builidng something. Arriving off the boat from the UK it’s not always an easy task to adapt to the Irish metric measures. It’s way too easy to read an 80km speed limit as 80 mph and hurtle too fast around the winding rural minor roads. Many of the rural roads are single track and pedestrian walkways are a rarity posing a real danger of inadvertently mowing down an unsuspecting local or dog. During our stay we came across a good half a dozen dogs out for a happily unaccompanied stroll down the main road and more than a few dutiful husbands returning from doing the grocery shopping. This year as always we hired a cottage. The Irish countryside is a mass network of, often unmarked, minor roads along which single storey homes huddle in expansive plots of land, which the sat nav recognised as separate villages with nary a single sign to confirm it. The Eircode postcodes were introduced in 2015, but we have yet to come across an address that actually uses one. Consequently we used the tried and tested list of directions: go through this village, turn right at that one, go down the road for a couple of miles past the so and so petrol station or pub and turn up a single track country lane. Despite our landlords dubious sense of distance and a couple of untended detours, we found our cottage and soon settled in. ‘Cottage’ has a bit of a fluid interpretation, though never in a negative way in our experience. It could mean a four bedroom two storey house or a one bedroom bungalow, but ‘tardis’ always seems to fit best. For a modest fee every cottage we have stayed in has been smart, spacious and homely. It’s something of an Irish tradition to buy a plot of land and self – build something with everything you could want from a home including a large kitchen dining room, the focus of family life, and an interesting array of nick nacks. Settled and happily pottering in our home from home, the TV, its mumblings ever present in our house for fear the husband might miss a major political occurance, fell into an eerie silence. The six o’clock chimes calling the faithful to prayer had completely slipped my mind. 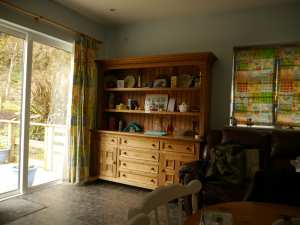 Strangely soothing, like the hypnotic aroma of incense, the sonorous peal filled every corner of the cottage and floated out through the windows to the vista of blue sky, green fields and the distant shush of the sea. There’s a lot said about religion and Catholicism in particular, but it does focus the mind and goes a long way to understanding the Irish Nations overriding interest in Irish matters, unlike the English who often have an unhealthy interest in everyone elses business beyond their own.